High end Classical Guitar Made in Spain 2009. Solid Spruce Top and African Mongoy (Ovengkol) Hardwood Back and Sides. Comes factory loaded with Fishman Prefix Pickup system. w/Quality Hard Case. A cool little 3/4 sized children's beginner nylon string. Minor cosmetic damage. Classical/nylon string. Made in Spain, full concert size. Solid spruce top, Indian rosewood back and sides, Ebony fingerboard. * Superficial crack in lacquer on back of the neck and a tiny one on the soundboard. Doesn't affect sound or playability at all. Made in Japan 1970s. Classical/nylon string. 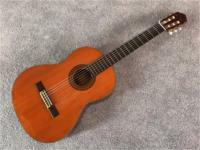 Made in Japan 1971/72 Epiphone EC-25 classical guitar. Cedar top and rosewood back and sides. Heavily decorated! With original case. Concert Guitar. Classical/nylon string. Made in Japan 1980. Just set up and playing sweetly! Handcrafted in Japan. Very nice classical/nylon string guitar. Solid Cedar top. Rosewood back and sides. Nato neck. Excellent craftsmanship! Classical / Nylon string. Made in Japan circa 1990. Solid Spruce top. Rosewood back and sides. Made in spain. Advanced Series. Popular flamenco model. The solid cedar top means the tone will mature with the instrument. High quality woods with a high standard of finish. Back and sides are mahogany with a mahogany neck and gloss finish. Vintage 1960s Japanese made classical/nylon string guitar. Made in Australia. 1969. Spruce top & delicate bracing with antique mahogany finish. 1971 Hand made in Japan. Solid Cedar top. Rosewood back and sides. Ebony fingerboard. Very nice! Nylon String Classical Made in Japan circa 1970's! Upgraded machine heads. Some cosmetic scars but sounds fine. 1980 Made in Japan Grand Concert classical/nylon string guitar. Hand built and signed by master luthier Hideyuki Ezaki! Solid spruce top. Indian rosewood back and sides. Mahogany neck. Ebony fingerboard. A very nice guitar! Plays and sounds beautiful! Includes 1980s S.Yairi hard case. 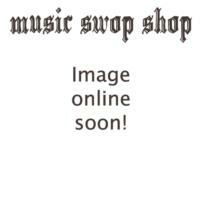 Enter your email address below to get alerts for Classical/nylon.